I had the chance to connect with Innis & Gunn founder Dougal Sharp to talk about their innovative marketing, their unique barrel-aging process, and how his brand transforms a basic bottle of beer into an unbeatable experience. DAMIAN BAZADONA: Tell me about Smoke & Mirrors. What triggered that? DOUGAL SHARP: At times, I think everyone's felt that perhaps politicians aren't being entirely truthful. In our pub one night, we were chatting away, and somebody suggested, you know, I wonder if you could brew a beer with truth serum in it. It just kind of went from there. We thought, what a wonderful way to spark a conversation about the political process and honesty. DB: Tell me about your company's mission. DS: Innis & Gunn is on a mission to change the world of beer and open up people's minds to what beer could be. Show them through the products that we make and the experiences that we deliver in either our products or our bars, just how great beer can be. DB: How did you sell the product in the beginning? What did you focus on? DS: The look of the packaging that we created in the early stages was unlike anything else in the marketplace. All of our materials that we used, all of our posters and any of the sort of campaigns that we put on social media, it was all about how we made the beer and the wonderful product attributes and how you could use the product. Of course, another important angle on it was we did lots of tastings. I could be working behind a tasting booth or a tasting bar at some festival and somebody will have their first-ever taste of Innis & Gunn. We often will see a look of surprise on their face, and then there'll just be this massive beaming smile, and they'll look back and go, "My God! That's amazing." Then they're like, "How'd you get this taste and why did you do this?" It's an amazing feeling. DB: What's the ideal craft beer experience? DS: You know, when you open a bottle of mass-produced beer, you pop the cork and you make out a soft faint beery smell, and you know you'll have a nice experience, but it's not going to change your life. If you open an amazing bottle of oak-aged beer like an Innis & Gunn Original, you get this amazing smell of oak and vanilla and toffee and you pour it in a glass and you get all those aromas and you have your first sip and you get that incredible flavor. The whole thing is an experience. 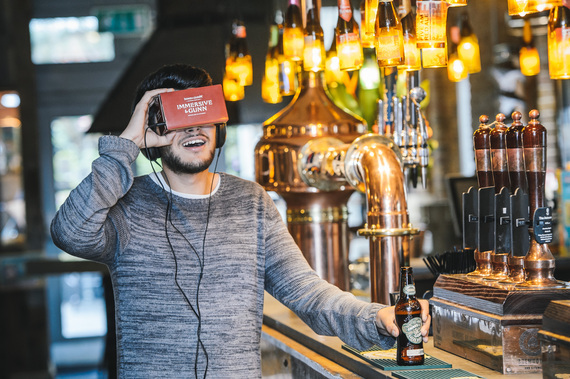 DB: Talk about the results of Immersive & Gunn, your virtual reality campaign where customers receive a VR headset filled with sights and sounds inspired by the flavors in their chosen beer. DS: We did a media launch in London for Immersive & Gunn. We had about fifty journalists, drinks writers, food writers, that sort of thing. Every one of them that I did an interview with after the VR experience spoke to me about their beer flavor for ten minutes. I've been in beer for thirty years, and I have never in my whole life had the chance to speak to any sort of media guy or girl about beer flavor for ten minutes. That, to me, is evidence that what we're doing is the right thing. DB: You guys run your own bars, too? DS: We've got two bars in Scotland, soon to be three within the next few months. Of course, these things like Immersive & Gunn and Smoke & Mirrors will be in our bars. DB: That's a very interesting angle, because a significant number of people only drink beer in communal moments. You must learn a lot just watching people drinking in front of you in a group. Does it play a role in product development? DS: Absolutely. Our bars are fundamental. They serve all sorts of different roles, but one of them is learning. We give people an Innis & Gunn experience in our bars, from the service to the products, the food, the range of drinks, the cocktails, the wine. Everything's an Innis & Gunn experience. We're picking things that we think are really, really good and that we love and present them to our customers in a way in which we think will satisfy their need for an experience. We've got glass walls for the whole barrel room in the bar. You can look inside and you can pick, much like the old-fashioned lobster tank in the restaurant. You can go, "I'll try this one, please." There's the theater of pouring this amazing barrel-aged beer into a glass and trying it and comparing it to the one next to it to see how it's different. They all create talking points. DB: I always say that experiences trigger an emotion worth feeling. If it doesn't trigger an emotion worth feeling, it's not an experience. DS: Beer is often the linchpin of people's social experiences. You can never get that emotional response with mass-produced products. That's the difference with craft beer. Learn more about Innis & Gunn.